Pastel at CAFNR's Foremost Dairy Research Center. 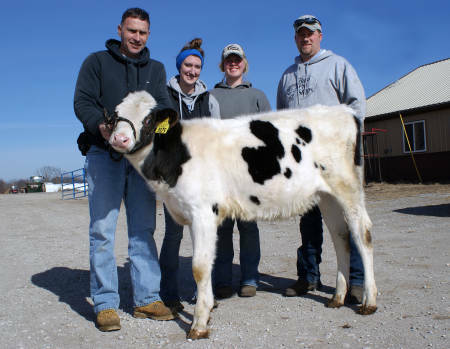 John Denbigh, dairy farm manager, with Pastel, Amanda Fischer, animal science major, Ann Callahan, pre-veterinary medicine, and Eric Adkins, research specialist. 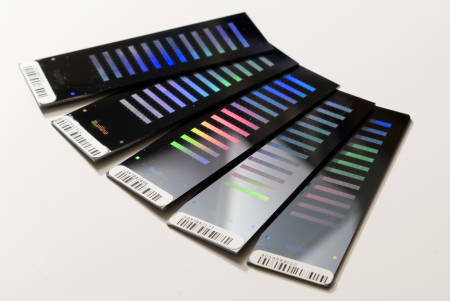 Often referred to as a SNP chip, it allows scientists to obtain information concerning the DNA bases present in an animal at over 50,000 predetermined positions within the genome (the genome is the entire DNA of an animal). Since its 2007 introduction, this assay has been applied internationally within the dairy and beef industries to improve genomic selection options, said Jared Decker, assistant professor of beef genetics extension and computational genomics. This approach allows the estimation of an animal’s genetic merit at birth from a DNA sample that may be obtained from hair roots, blood sample or even a nose swab. Predictions of genetic merit made through SNP data are now actively being used by Holstein breeders to make selection decisions on bulls. The industry received immediate benefits from substantial gains in the accuracies of predicted genetic merits early in an animal’s life, allowing easier identification of superior animals at a lower cost. This permits more rapid genetic progress, Decker said. The SNP chip is now part of the criteria that identified Pastel’s superior traits. Research is also continuing today at MU in improving dairy and cattle traits in other ways. The MU animal genomics group is involved in research to utilize DNA technology for the prediction of genetic merit for economically important traits in cattle, including disease susceptibility, feed efficiency, milk production, reproduction and growth.